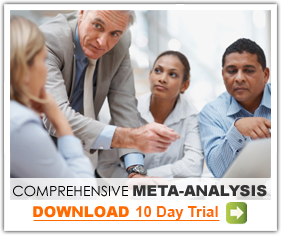 Meta-analysts working with medical studies often use the term “Treatment effect”, and this term is sometimes assumed to refer to odds ratios, risk ratios, or risk differences, which are common in medical meta-analyses. Similarly, meta-analysts working in the social sciences often use the term “Effect size” and this term is sometimes assumed to refer to standardized mean differences or to correlations, which are common in social science meta-analyses. In fact, both “Treatment effect” and “Effect size” can be used (and are used on this site) to refer to the identical set of indices - odds ratios, risk ratios, risk differences, standardized mean differences, raw mean differences, correlations, rate ratios, rate differences, and hazard ratios. The distinction between “Treatment effect” and “Effect size” lies not in the index but rather in the substance of the meta-analysis. When the meta-analysis looks at the relationship between two variables or the difference between two groups, its index can be called an “Effect size”. When the relationship or the grouping is based on a deliberate intervention, its index can also be called a “Treatment effect”. For example, the difference between treated and control groups, or between intervention-A and intervention-B could be called either a treatment effect or an effect size. By contrast, the difference between groups that had been exposed vs. not exposed to asbestos, or the difference between males and females would be an effect size, but would not be a treatment effect. What characterizes an effect size (and treatment effect) is that it looks at effects. Other meta-analyses do not look at effects but rather attempt to estimate the event rate or mean in one group at one time-point. For example, “What is the risk of Lyme disease in Wabash” or “What is the mean SAT score for all students in Utah”. These kinds of indices are called simply “Point estimates”, a generic category that includes the category Effect size, which in turn includes Treatment effects. Fortunately, these distinctions are largely unimportant. In any meta-analysis, and in CMA, the mechanisms for computing effects, running analyses, and presenting data are largely the same for all these kinds of data.